To purchase any of the items below, click on the purchase link. This will download the order form, print and complete it, then post it to the AGS (the address is given on the form). Payment may be made by cheque (payable to The Australian Geomechanics Society) or by credit card (Visa or Mastercard). All prices are in Australian dollars and include GST. The complete set of Australian Geomechanics on DVD or USB stick. This includes all journals published between 1971 and 2011, inclusive. In addition, the DVD contain the tables of contents of the ten ANZ Conferences on Geomechanics, as well as the 1985 AGS Commemorative Volume, which included a selection of the best papers by Australian authors up to that time. Each issue consists of a series of PDF files. Each technical paper has been saved as a separate PDF file, as has the issue’s cover (most of which are in colour). The other pages that make up each issue, which consists of society matters, obituaries, news, conferences, and other general material, have been saved as a single PDF file. AGS members are entitled to a discount of 15% on these books. When ordering online, simply quote GeoWP11. A limited number of the 11th ANZ Conference Proceedings, in CD of all the papers is available for sale from the AGS Secretariat for the price of $150 includes postage. Please contact Peter Robinson at PO Box 955, ST IVES NSW 2075. A limited number of the 10th ANZ Conference Proceedings, in two volumes, including the CD of all the papers is available for sale from the AGS Secretariat for the discounted price of $65 plus postage. The normal price was $150. 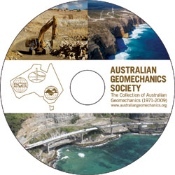 The proceedings, on CD, of the GeoEng2000 conference held in Melbourne. Editors: Sloan, SW, Allman, MA, The University of Newcastle, Newcastle, NSW, Australia, February, 1995 (“Orange Book”). Editors: Fityus, S, Hitchcock, P, Allman, MA, Delaney, M, The University of Newcastle, Newcastle, NSW, Australia, February, 1998 (“Blue Book”). Eds Smith, D, Fityus, S, Allman, MA Newcastle, NSW, Australia, November 2001.